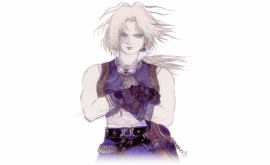 Zidane, a confident thief and self-styled ladies' man, plys either trade with equal gusto; his ability earned him a place in the family of Tantalus. At times the well-traveled, capricious Zidane is playful and glib, yet his no-nonsense attitude--as well as an unflagging devotion to his friends and their well-being--indciates a maturity atypical of a mere teenager. With no recollection of his past, Zidane lives only for the present, the day-to-day. But the truth of his origin, lingering portentously in the background, threatens to catch up to him. Zidane can pilfer a single item from an enemy. Enemies in FFIX often carry more than one item, so Zidane can use the "Detect" command in the "Skill" set to see all the items an enemy has. However, items listed last tend to be difficult to steal. Befitting a bandit, Zidane's skills serve all sorts of useful functions in battle. Detect See the enemy's items. What's That!? Allows back attack. Soul Blade Draws out the hidden power in thief swords. Annoy Causes Trouble to the target. Sacrifice Sacrifice yourself to restore HP and MP to the other party members. Lucky Seven Deals physical damage by luck. Auto-Reflect Automatically casts Reflect in battle. Auto-Float Automatically casts Float in battle. Auto-Haste Automatically casts Haste in battle. Auto-Regen Automatically casts Regen in battle. Auto-Life Automatically casts Life in battle (after character is KO'ed). HP+20% Increases HP by 20%. Accuracy+ Raises physical attack accuracy. Distract Lowers enemy's physical attack accuracy. Long Reach Attack power in the back row is the same as in the front row. MP Attack Uses own MP to raise attack power. Bird Killer Deals lethal damage to flying enemies. Bug Killer Deals lethal damage to insects. Stone Killer Deals lethal damage to stone enemies. Undead Killer Deals lethal damage to undead enemies. Devil Killer Deals lethal damage to demons. Beast Killer Deals lethal damage to beasts. Man Eater Deals lethal damage to humans. Master Thief Steal better items. Steal Gil Steal gil along with items. Add Status Adds weapon's status effect (Add ST) when you attack. Gamble Defense Raises defense occasionally. High Tide Allows you to Trance faster. Counter Counterattacks when physically attacked. Protect Girls You take damage in place of a girl. Eye 4 Eye Raises Counter activation rate. Body Temp Prevents Freeze and Heat. Level Up Characters level up faster. Ability Up Characters learn abilities faster. Flee-Gil Receive gil even when running from battle. Antibody Prevents Poison and Venom. Restore HP Restores HP automatically when near death. Jelly Prevents Petrify and Gradual Petrify. Auto-Potion Automatically uses (least powerful) Potion when damaged. Mug Damages enemy when you steal. Bandit Raises success rate of Steal.